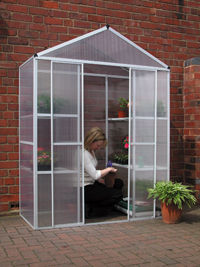 This Step in Planthouse is the perfect size for a home gardener with limited space, who wants to get an early start on seedlings, and perfect for those Tomatoes, plenty of flexible shelf space (included) good protection against winter frost. 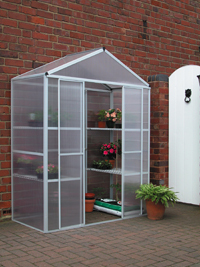 Aluminium frame, Glazed with twin wall child safe polycarbonate, wide twin door for easy access and good ventilation. For maximum stability to be sited against a wall, or fence.